Karla is originally from El Salvador in Central America. 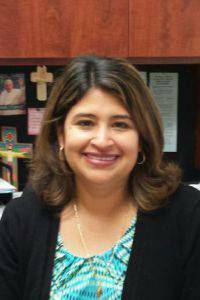 She has been married to her husband Roberto for 20 years, and is the mother of four children: Roberto, who is a student at Rockhurst University, and Josealonso, Gabriel, and Isabella, who attend St. Paul Catholic School. Karla is dedicated to practicing the Catholic faith with an appreciation of the Catholic tradition and an awareness of its contemporary expression. She is highly committed to Catholic Education and the mission of the church. Her Faith Formation training includes: Leadership in the Hispanic Ministry for New Evangelization, Archdiocese of Kansas City in KS training for Ecclesial Ministry for Youth and Adult Leaders, Advanced Formation from St. Edward's University in Austin, TX, and a Symposium on Leadership for a Comprehensive Pastoral Juvenile from The University of St. Paul, MN. She is currently working on a Certification through Franciscan University in Ohio.